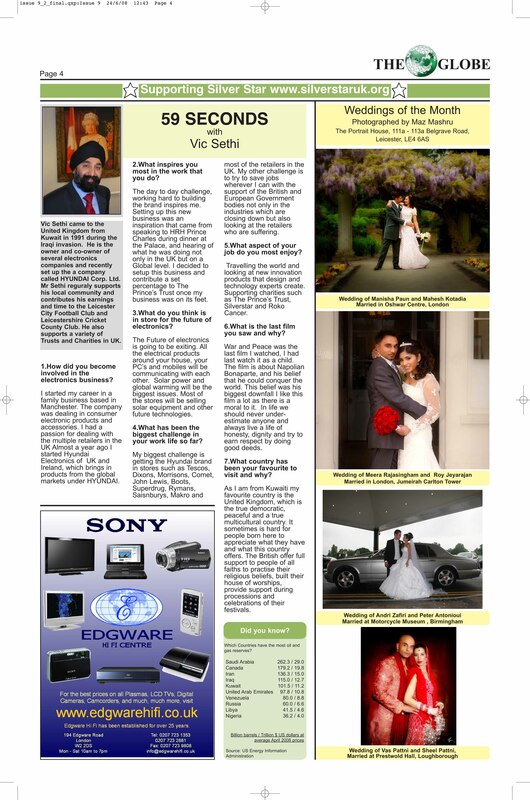 Vic Sethi came to the United Kingdom from Kuwait in 1991 during the Iraqi invasion. He is the owner and co-owner of several electronics companies and recently set up the a company called HYUNDAI Corp. Ltd. Mr Sethi regularly supports his local community and contributes his earnings and time to the Leicester City Football Club and Leicestershire Cricket County Club. He also supports a variety of Trusts and Charities in UK. 1.How did you become involved in the electronics business? I started my career in a family business based in Manchester. The company was dealing in consumer electronic products and accessories. I had a passion for dealing with the multiple retailers in the UK Almost a year ago I started Hyundai Electronics of UK and Ireland, which brings in products from the global markets under HYUNDAI. 2.What inspires you most in the work that you do? The day to day challenge, working hard to building the brand inspires me. Setting up this new business was an inspiration that came from speaking to HRH Prince Charles during dinner at the Palace, and hearing of what he was doing not only in the UK but on a Global level. I decided to setup this business and contribute a set percentage to The Prince’s Trust once my business was on its feet. 3.What do you think is in store for the future of electronics? The Future of electronics is going to be exiting. All the electrical products around your house, your PC’s and mobiles will be communicating with each other. Solar power and global warming will be the biggest issues. Most of the stores will be selling solar equipment and other future technologies. 4.What has been the biggest challenge in your work life so far? My biggest challenge is getting the Hyundai brand in stores such as Tescos, Dixons, Morrisons, Comet, John Lewis, Boots, Superdrug, Rymans, Saisnburys, Makro and most of the retailers in the UK. My other challenge is to try to save jobs wherever I can with the support of the British and European Government bodies not only in the industries which are closing down but also looking at the retailers who are suffering. 5.What aspect of your job do you most enjoy? Travelling the world and looking at new innovation products that design and technology experts create. Supporting charities such as The Prince’s Trust, Silverstar and Roko Cancer. 6.What is the last film you saw and why? War and Peace was the last film I watched, I had last watch it as a child. The film is about Napolian Bonaparte, and his belief that he could conquer the world. This belief was his biggest downfall I like this film a lot as there is a moral to it. In life we should never underestimate anyone and always live a life of honesty, dignity and try to earn respect by doing good deeds. 7.What country has been your favourite to visit and why? As I am from Kuwaiti my favourite country is the United Kingdom, which is the true democratic, peaceful and a true multicultural country. It sometimes is hard for people born here to appreciate what they have and what this country offers. The British offer full support to people of all faiths to practise their religious beliefs, built their house of worships, provide support during processions and celebrations of their festivals.